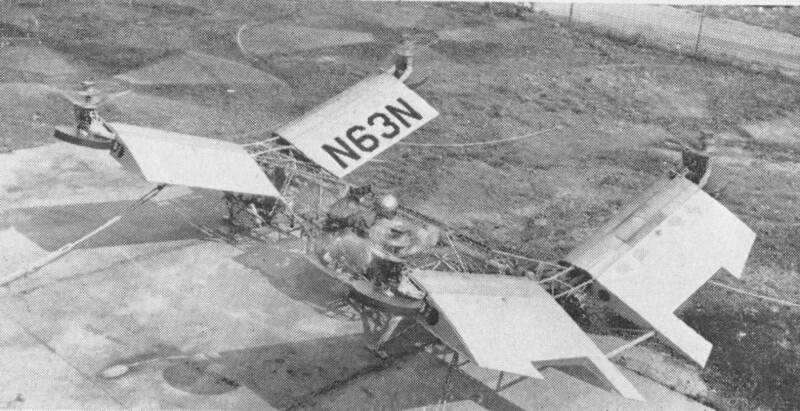 As the result of Convertawings' further developmental work on this four rotor configuration, a first prototype was completed in 1955 and it has flown successfully. The four rotors of this helicopter are mounted laterally on outriggers in two tandem pairs. The four rotors were positioned in an "H" configuration, and the design incorporated simplified hubs with strap-mounted blades, a form of "hinge-less" rotor. The control mechanism is extremely simplified and obtained by differential change of thrust between the rotors. There is no cyclic control, but only collective control. In the experimental prototype the fuselage was of tubular steel, the booms supporting the rotors in aluminium alloy. Power is provided by two engines connected to the rotor drive system by multiple vee belts. Shafting and transmission cases ensure inter-connection between the four rotors, so that either engine can drive all of them. There is a tricycle undercarriage with two wheels in the rear section and a nose wheel which can swivel. 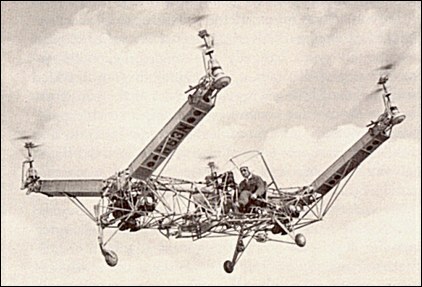 The Quadarotor A was a small test vehicle for the Projecled 60-76 passenger Model E Quadrotor on the same general lines. The Model E is intended to have four R-1820 piston-engines or Dart turboprops, mounted directly under the rotors. The first flights took place in March 1956, flown by its designer and test pilot, D.H.Kaplan. Despite successful testing and development, military support for the Quadrotor ceased after cutbacks in defense spending. However, the design - particularly its control system - was a precursor of future experimental vertical-rising aircraft.